Anti-fungal and anti-bacterial additives in house paint are present in dangerous quantities in the Vauchère river basin in the city of Lausanne, says a study to be presented the 9th of December, at the American Geophysical Union (AGU) conference in San Francisco. Chemicals engineered to kill microorganisms, called biocides, are added to exterior paints in order to prevent molding and plant growth. Washed off of building facades during heavy rains, however, these chemicals can be wind up in soil, groundwater and river basins where they attack bacteria, fungi and algae at the bottom of the food chain. Researchers at EPFL's Ecological Engineering Laboratory have now modeled the flow of biocides from building façades into river basins with surprising accuracy, which could lead to stricter regulations for Switzerland and abroad. In Switzerland, biocides are present in exterior paint on some 60% of buildings and they are common worldwide. The global demand on all biocides for use in industrial and consumer goods was estimated at US$6.4 billion in 2008. Certain antifouling biocides have been phased out of use on boat hulls after being proven toxic to marine life. The mathematical tool developed by Sylvain Coutu at EPFL accurately predicts peak concentration levels in a local river of three biocides commonly found in industrial paint: DCMU, Terbutryn and Carbendazim. 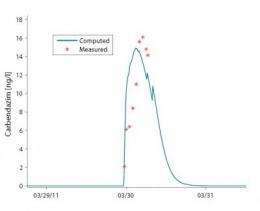 Coutu predicted the concentration of these biocides after four rainstorms during the spring of 2011 and compared the numbers to actual measurements taken from the river. The model proved accurate up to a couple of nanograms per liter, an impressive feat considering the variety and complexity of variables. The model's strength comes from its ability to simplify urban surface hydraulic behaviorshow water is channeled down streets and gutters or lawns and gardensand still remain extremely accurate. "A true toxicology report should include peak levels of concentration after rainfall, and we have created the first model that takes them into account over a period of time," says Coutu. Establishing a working model has the advantage of reproducibility as well as reducing dependency on expensive testing. Once a reliable model has been created it can be used in other regions, although the model needs to be adapted to the specific geography, for example the surface area of contaminated façades as well as the quick water drainage of urban surfaces. Once the input is determined and the dynamics of the hazardous substances reacting to rainfall are worked out, it is possible to estimate the concentrations of these substances to see if they exceed acceptable levels. 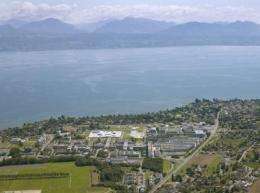 The biocides that reached the river basin in Switzerland did so in extremely small concentrations30 nanograms per liter, or 30 parts per trillion, of the chemical DCMU were present after heavy rains. DCMU is a common herbicide and algicide developed in the 1950s in Germany and the threshold concentration after which this substance is considered a threat for the environment is 20 nanograms per liter. DCMU is considered harmful and can potentially kill algae and other plantlife by inhibiting photosynthesis and thus depriving the organisms of energy. Biocides in general do not degrade easily, thus increasing their risk of moving up the food chain and making their way, in higher and higher concentrations, throughout the environment. "While it may seem like a very small concentration, 20 nanograms is all that is needed to have an impact on the ecosystem since these chemicals are engineered to kill at very low doses," explains Coutu. 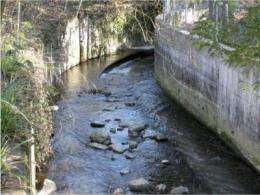 Furthermore, the study also proves that water behavior in urban environments can be accurately modeled, opening the door to further toxicology studies for city ecosystems.